The German philosopher Friedrich Nietzsche predicted a European collapse into a time where no one could define truth and the end of man was desired. In works of powerful and beautiful prose (writing that differs from poetry in its rhythm and closeness to ordinary speech) and poetry he struggled to head off the disaster. Friedrich Wilhelm Nietzsche was born on October 15, 1844, in Röcken, Germany, where his father served as a Lutheran pastor. Friedrich's father's death, when he was four years old, was distressing, which he often referred to in his later writings. Soon after, his youngest brother died, resulting in his mother moving her family in with her mother and two sisters. 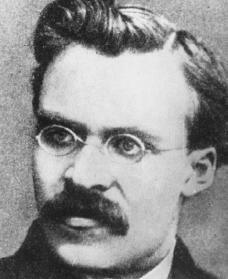 The death of both his father and his brother left Nietzsche in a household of women including his sister, Elizabeth. friends. At the end of this period of schooling, Nietzsche, who had earlier shared the Lutheran religion of his family, found that he had ceased to accept Christianity—a view that soon hardened into outright disbelief in any God. With the highest recommendations of his Pforta teachers, Nietzsche enrolled in the University of Bonn in 1864. There Nietzsche pursued classical studies with Friedrich Ritschl, and when Ritschl moved to Leipzig, Germany, Nietzsche followed him. Nietzsche attempted to enter into the social life of the students, even joining a dueling (formal combat with two people bearing weapons) club, but he soon discovered that his sense of his own mission in life had distanced him from the pursuits and interests most students shared. At this time, too, Nietzsche apparently contracted syphilis (sexually transmitted disease) in a brothel (house where people trade sexual acts for money). The incurable disease gradually damaged his strong body. In middle life he suffered almost constantly from head and stomach upsets. Loneliness and physical pain were the constant background of his life—though Nietzsche later came to interpret them as the necessary conditions for his work. Nietzsche's early publications in classical philology (study of literature and the languages of literature) so impressed his teacher that when a chair (professorship) of philology opened up at the university in Basel, Switzerland, Ritschl was able to secure it for Nietzsche, then only twenty-four years old and still without his degree. The University of Leipzig gave him his doctoral degree on the strength of his writings without requiring an examination. Nietzsche then entered upon a teaching career. The composer (writer of music) Richard Wagner (1813–1883) had greatly influenced Nietzsche's first book, The Birth of Tragedy (1872), which gave an imaginative account of the forces that led to the rise of Greek tragedy (a drama that describes a struggle between a hero and a larger force or power with a sad or troubled ending) and to its later fall. Nietzsche's book ends with support of Wagner's musical drama as a revival of Greek tragedy. But no sooner had it been published than Nietzsche began to see the difference between Wagner's musical genius and the shabby messages of the Wagnerian cult (devoted followers of Wagner). From then on, though he still felt affection for Wagner personally, Nietzsche attacked ever more strongly the "decadence" of Wagner's political and philosophical (having to do with knowledge) ideas. Two works of his last year of writing deal with the subject: The Wagner Case (1888) and Nietzsche Contra Wagner (1888). Nietzsche's teaching at Basel was interrupted frequently by prolonged bouts of sickness and by several months of service as a medical orderly during the Franco-Prussian War (1870–71; a conflict between France and the combined states of Germany, which resulted in the loss of some territory for France), which further irritated his illness. In April 1879 his health had weakened so much that he was driven to resign. He was given a small monthly income, and he now began a ten-year period of wandering in search of a friendly climate. Though having increasing pain from the ruthless progress of his disease, Nietzsche managed to produce one hundred one books before his final collapse. They belong to the first rank of German literature and contain a stimulating set of philosophical ideas. Nietzsche believed that European man was standing at a critical turning point. The advance of scientific enlightenment, in particular the Darwinian theory (Darwin's theory that man evolved from primitive life forms), had destroyed the old religious ideas. In Thus Spoke Zarathustra, Nietzsche wrote: "God is dead." Further, he declared that man, no longer "the image of God," is a chance product of a nature uninterested in purpose or value. The great danger is that man will find his existence meaningless. Unless a new grounding for values is provided, Nietzsche predicted a rapid weakening into destruction for society. Nietzsche aimed in all his work to provide a new meaning for human existence in a meaningless world. In the absence of any religious guidance, men must create their own values. Nietzsche's writings are either criticisms of the old system of values or attempts to form a new system. For European man, the traditions common to both Jewish and Christian religions were the source of the old values. Nietzsche attacked it head-on in such works as A Genealogy of Morals (1887) and The Antichrist (1888). In Nietzsche's constructive works he sought to find in life itself a force that would serve to set human existence apart. He found it in the theory of the urge to dominate and master. All creatures desire this, but only man has achieved sufficient power to turn the force back on himself. Self-mastery and self-overcoming are the qualities that give a unique value to human life. The ideal man, the "superman," will delight in being the master of his life, measuring out his passions, and giving style to his character. His power over himself and his life will give him a flood of creative energy. This will be the new reality and the standard by which all of life is judged. All morality (right conduct) is therefore the result of overcoming one's self, but Nietzsche had a standard by which to tell between the morality of the superman from the morality of Christianity. Christianity is based on the concept of afterlife. It attacks the idea of being master of your life, calling that idea "pride," and sees natural passions as evil, putting guilt and fear onto its followers. The new morality, on the other hand, will support life, encourage self-assertion, and do away with guilt. In Thus Spake Zarathustra (1883) Nietzsche formed the ultimate test of the superman's statements. Confronted with the notion that the world process is cyclical (circular or in sequence) and eternal, the superman still supports life. Let it be—again and again—with all its joys and sorrows. On January 3, 1889, Nietzsche collapsed on a street in Turin, Italy. When he regained consciousness, his sanity was gone. He began to send off wild letters to friends and strangers signed "Dionysus—the Crucified." He was taken to his mother's home and lived on in a semiconscious state, sinking ever further from the real world until his death on August 25, 1900. Andreas-Salomé, Lou. Nietzsche. Redding Ridge, CT: Black Swan Books, 1988. Elsner, Gary. Nietzsche: A Philosophical Biography. Lanham, MD: University Press of America, 1992. Hollingdale, R. J. Nietzsche: The Man and His Philosophy. Rev. ed. New York: Cambridge University Press, 1999. Kaufmann, Walter. Nietzsche: Philosopher, Psychologist, Antichrist. 4th ed. Princeton, NJ: Princeton University Press, 1974. Nietzsche, Friedrich. Selected Letters of Friedrich Nietzsche. Edited by Christopher Middleton. Chicago: University of Chicago Press, 1969. Reprint, Indianapolis: Hackett, 1996.